Not surprisingly, as more and more people embrace shooting stills and motion with HDSLRs, the interest in lighting products grows at a record pace. And many are discovering—and singing the praises of—LED lighting. While many HDSLR users’ initial exposure to LED lighting is often with the small units which can be seated in the camera hot shoe, those lighting applications are merely the tip of the iceberg in terms of applications for still and motion work. LED lighting, which is short for Light Emitting Diode, has become a staple in the film and broadcasting industry. I approached A.J. Wedding of ESS, the worldwide distributor of LEDZ products, to talk about the LED market and their unique product range. Q: What’s fueling the growth of LED usage for stills and motion? AW: There are several factors influencing the growth we are seeing: As companies increase their online advertising, there is a demand for more multi-media collateral. Advertisers now have an increasing need for motion. Right now, many shoots are being done as hybrids…half still photos, half video footage. And you can’t shoot both at the same time with flash. 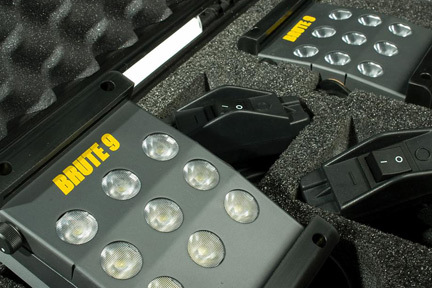 The only continuous lights that have been powerful enough to match flash have been HMIs. As more powerful LED products have become available, they have become viable competitive lighting alternatives for many imaging professionals. While LEDZ lights can currently only take the place of low-end HMIs, this is still an amazing feat. And the technology continues to develop. There is also the Green factor: With the whole world going green, everyone wants to find smarter and more efficient energy solutions, and this trend has tremendous appeal in “Hollywood”. Any time you can create lights that are more energy efficient, create less heat, and still give off the true color spectrum needed for serious cinematography, it’s a no brainer. 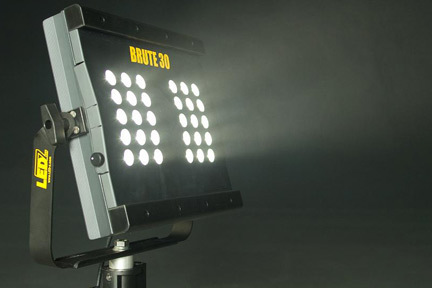 Then there are the cost considerations: The upfront cost of the more powerful LED units like our Brute 30 unit tends to cause sticker-shock, but you really have to compare it to all of the costs associated with an equivalent HMI. Our LEDZ lighting units and their diodes are guaranteed for 40,000 hours of usage; for the same life that our lights are guaranteed for, you will pay $55,000 for new globes for an equivalent HMI product. The savings to a rental house which on average spends $250,000 on globes per year…well, you can do the math. This translates into immediate and long term cost savings. Q: What distinguishes the LEDZ line from some of the other LED options in the market? AW: LEDZ is definitely a very different type of light from other LED lights. That is why we compare our products with HMIs, rather than other LED brands. Most LED brands are very good at offering a nice, soft fill that is great at a distance of three to four feet. That is not our world. Our engineers have created a unique product that has the kind of throw and punch equal to the more powerful tungsten alternatives and HMI lighting in the 100 to 400 watt range. LEDs offer inherently soft light, and getting them to fire long distances is quite a challenge, but we have created that punch and in doing so have distinguished ourselves from other LED product on the market. Q: Tell us about the LEDZ line. AW: The LEDZ Line consists of: The Mini Par (a compact light with three interchangeable lenses for spot and flood settings); the Brute 3 (an amazingly powerful light that can fit in small spaces, be used as a reporter light, or any 1/4″ 20 mount); the Brute 9 (a “sun-gun” alternative which can be fitted with a handle, or used as a soft fill on a stand); the Brute 16 (our workhorse, equivalent to a 200 watt HMI or 1k tungsten source); and the Brute 30 (equivalent to a 400 watt HMI or nearly a 2k tungsten source.) All of our products are fully dimmable. Q: What power options are available? AW: Currently, all of our lighting units come with AC/DC power. With the exception of the Brute 16, all of our units are 12V compatible, so they can be plugged into many commercially available battery units. We are, however, in the process of manufacturing a universal battery system that should be available later this year. Q: Are LEDZ products only for the “professional” market? AW: LEDZ lights are distributed by Hollywood Rentals, and in order to cater to our main customers, we had to make sure that the lights we created were durable, powerful, and could withstand the scrutiny of Hollywood’s top cinematographers and gaffers. Does this mean that non-professionals can’t use them? No. Anyone who wants a high quality light for any reason, be it a Web series, home video, or whatever you shoot should consider LEDZ lights. 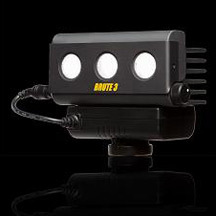 In terms of our product price range, The Brute 3 retails for $450, while the top of the line Brute 30 retails for $4900. Q: Where can people who are interested in LEDZ products buy them? AW: The best place to go is www.led-z.com, and you can find your nearest dealer. If you can’t find someone near you, you can contact Manny Barreras at ESS. His info is on the Website. Thanks to A.J. Wedding and Manny Barreras of ESS. I do want to make final point and this is a general observation about the use of smaller LED lighting units. While LEDZ does not offer lights with a hot shoe mount, their smaller lighting units can be used on-camera with third party adapters. While many people are inclined to mount smaller LED lights on their cameras, unless you are using your camera for “ENG” (electronic news gathering) type applications which have very specific lighting objectives, I recommend that you move those units off-camera, and mount them to a stand or on a handle. 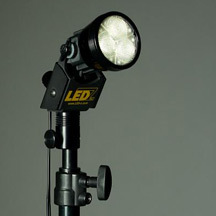 “On-camera” continuous lighting, like “on-camera” flash, although usually less powerful, is still direct light and is more often than not, less flattering than other alternatives. Ask most people about on-camera lighting options for their dslr, and the default response is usually a dedicated flash unit. And certainly the ttl capabilities of these units make them a natural. But over the last six months I have been exploring alternative on camera lighting options and have found myself genuinely excited over the new generation of LED continuous lighting options. They are small, don’t give off much heat, and what you see, is what you get. They also don’t give that obvious “flash” look image that can result with speedlights . With the arrival of the Nikon d90 and the Canon 5d Mark II, both of which have hi def video capability, continuous supplemental light sources are going to grow in popularity as they can be used for both still and video capture. While there are several manufacturers who have led lighting available. I have been using the Litepanels Micro units. I found my units at the Calumet Photographic Store, here in NYC, but they are available at other major photo retailers as well. They can be mounted in the hot shoe or off camera. They are a little over 3”x3”x1.5” in size and weigh about a quarter of a pound. No power tap compatibility issues. They are fully dimmable and flicker free! You can dial in your desired fill easily. There is an integrated filter holder and you get a tungsten conversion gel, as well as warming and diffusion gels in the kit. The run time using lithium batteries is about 7 hours. They can be run off ac with an optional adapter. They allow for quick location shooting without drawing the kind of attention that flash use often does. While Litepanels doesn’t indicate the power rating, I suspect that at full power the micro is equivalent to about 25-30 watts. The 3”x3” panel configuration results in a pretty wide beam coverage area, and can impact scene illumination up to 10 to 12 or so, feet away. If you are interested in continuous lighting options, such as LEDs for your still or hybrid (still and video capable) camera, make sure the unit is fully dimmable. You definitely want this level of control. Some products offer it while others do not. Try to buy a unit that has gels/filters available. If you do not buy one with gels, you should fashion them on your own. For still and video work, the latest LED products are definitely worth exploring. As LEDS go, I have been extremely pleased with the performance of the Litepanels Micros. Two Litepanels Micros were mounted on a dual light head cross bar and oriented vertically to the right of the camera. A silver reflector was used camera left for additional fill. A single Micro was placed above the camera and angled down towards model. The balance of the illumination in the scene is provided by one shaded lamp, camera left.